Designed by Quadrangle, 38 Dan Leckie Way distinguishes itself through modern materials and twisting geometry. 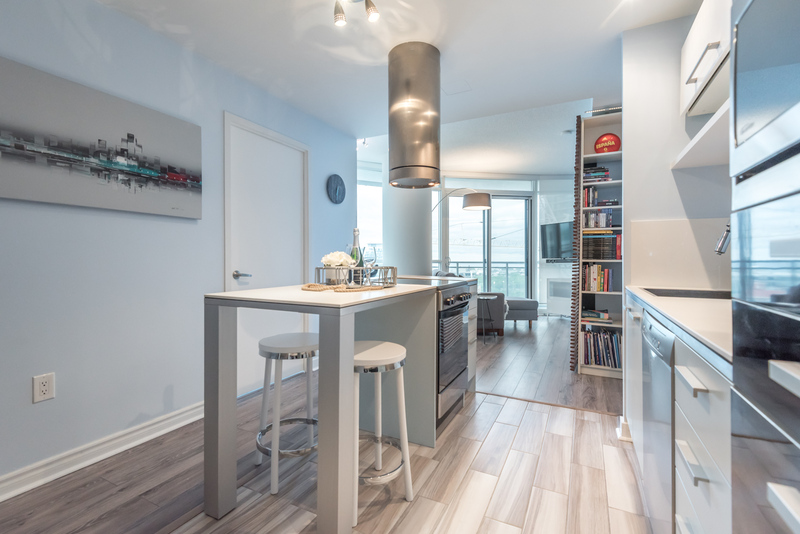 The appropriately named Panorama Condos offers sweeping views of Toronto’s Harbourfront. Its gorgeous steel and glass body rises 29 floors, with a beautiful curving architecture that maximizes the scenic waterfront view. 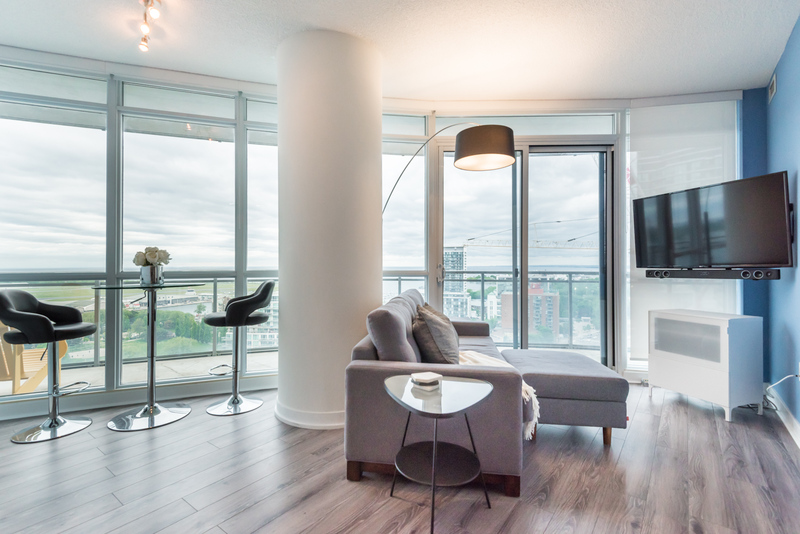 The condo’s winding design presents a fuller vision of Toronto’s urban and natural landscapes. Developed by Concord Adex, 38 Dan Leckie Way is part of a master-planned community known as CityPlace. The area consists of shops, schools, restaurants, spas, and the famous Canoe Landing Park, all of which are steps away from Panorama. Suite 2301’s foyer is lit by halogen lamps. An extra-long closet provides tons of storage while mirrors add the illusion of space. 38 Dan Leckie’s interior is a marvel of modernity. 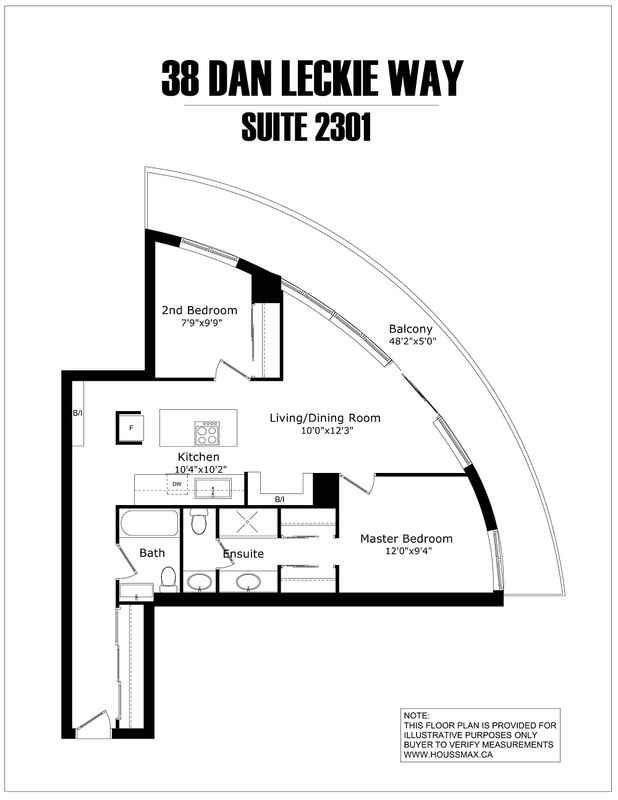 At almost 900 square feet, it comprises of 2 bedrooms, 2 washrooms, and a huge wrap-around balcony. Add an open-concept design, lavish hardwood floors, and dazzling light-fixtures, and you’ve got your dream condo. Chic. Classy. Contemporary. These words fail to capture 38 Dan Leckie’s true elegance. Understated yet beautiful, 38 Dan Leckie’s kitchen has recessed appliances and plenty of drawers, cabinets and shelves. 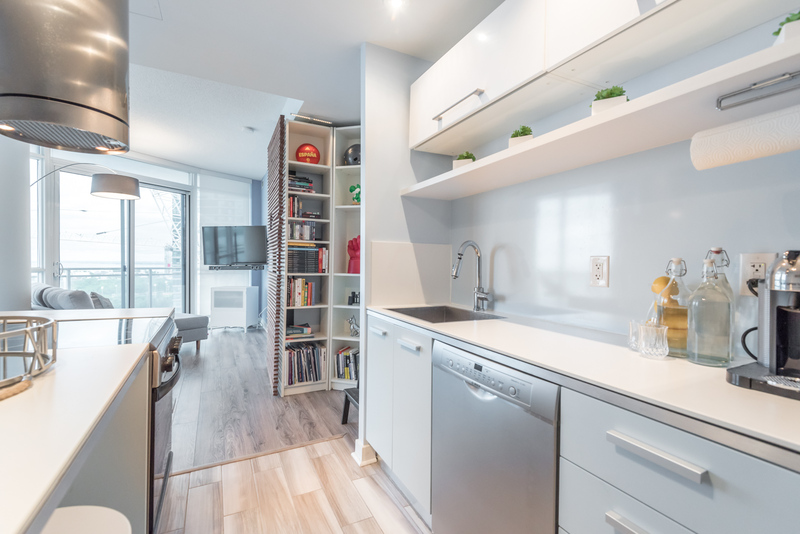 The kitchen makes clever use of space, like the shelf-mounted paper towel dispenser. 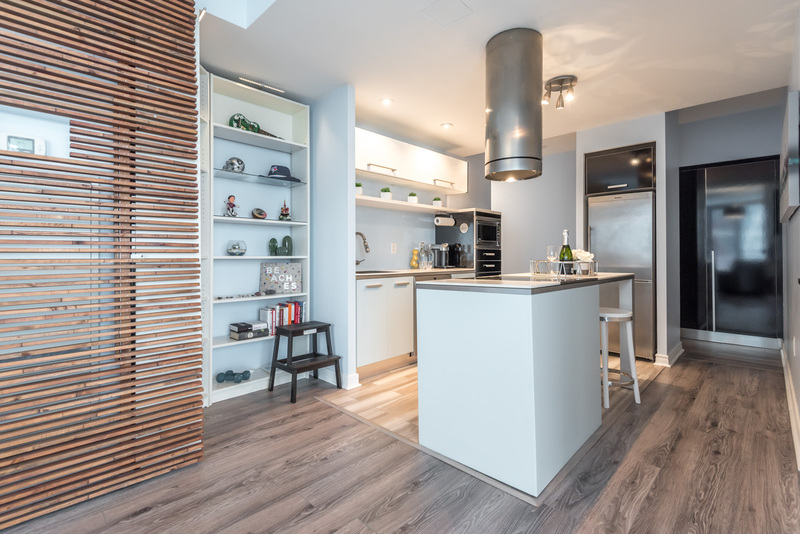 Other highlights include European cabinetry, a chrome faucet with detachable head, and a glossy blue backsplash. Potlights provide ample illumination, while also casting gorgeous glimmers and shadows across the ceiling. The living and dining areas are exquisitely designed, with calming colours, luxurious materials, and robust lighting. A large pillar also divides one room from another without actually separating them (thus maintaining continuity). Note how the floorboards run diagonally rather than straight. This lack of symmetry mirrors the building’s exterior. Furthermore, the floor-to-ceiling windows stretch from wall-to-wall, curving gently with the balcony. As a result, 38 Dan Leckie way is always brilliantly illuminated with natural sunlight. 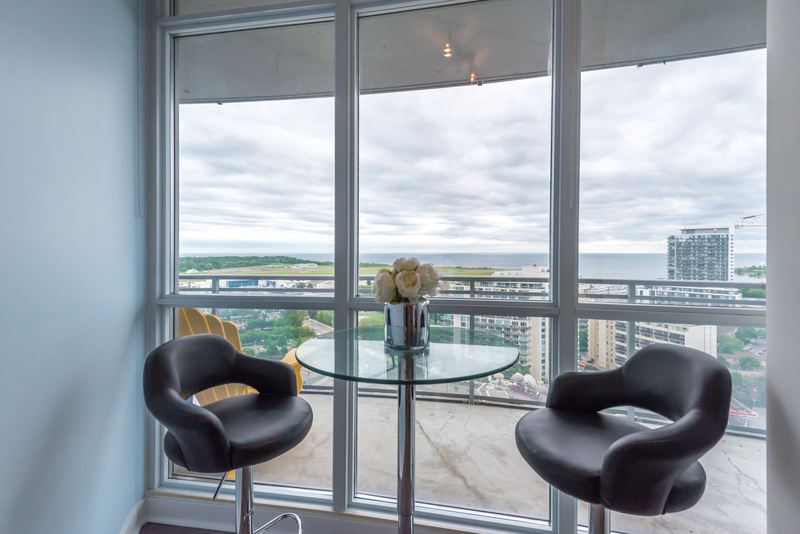 No need to step out onto the balcony; residents have an extraordinary view of Toronto from the comfort of their dining room. In addition to looking great, the living and dining areas are remarkably spacious. The open-concept design creates an unbroken flow from foyer to balcony, dramatically increasing our sense of distance. Those ultra high-ceilings also amplify our overall impression of space. 38 Dan Leckie Way has 2 bedrooms. 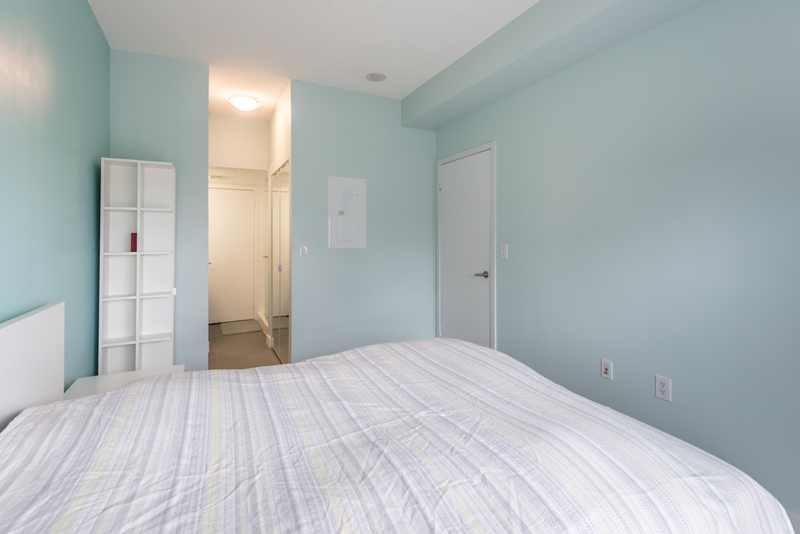 The master bedroom features dark laminate floors, massive floor-to-ceiling windows, and an ensuite bathroom. 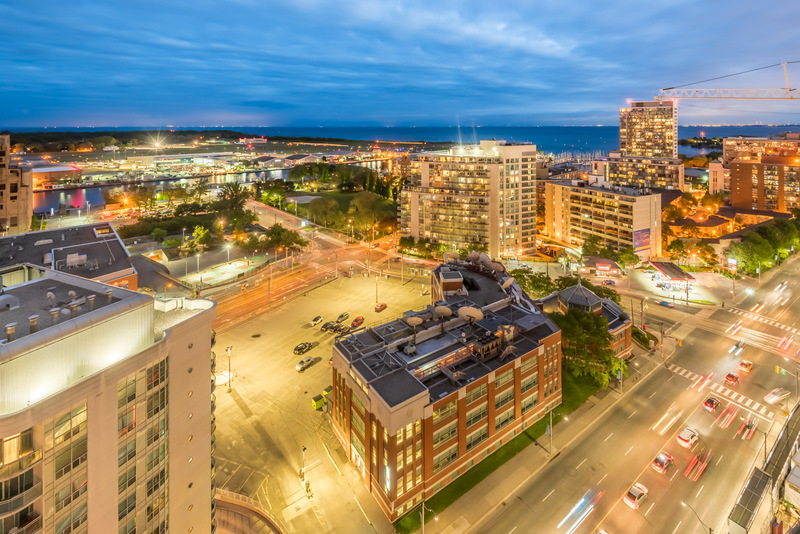 It also overlooks the Gardiner Expressway, Lake Ontario, and many prominent buildings. At the opposite end you’ll find His & Her closets and a 4-piece bathroom. 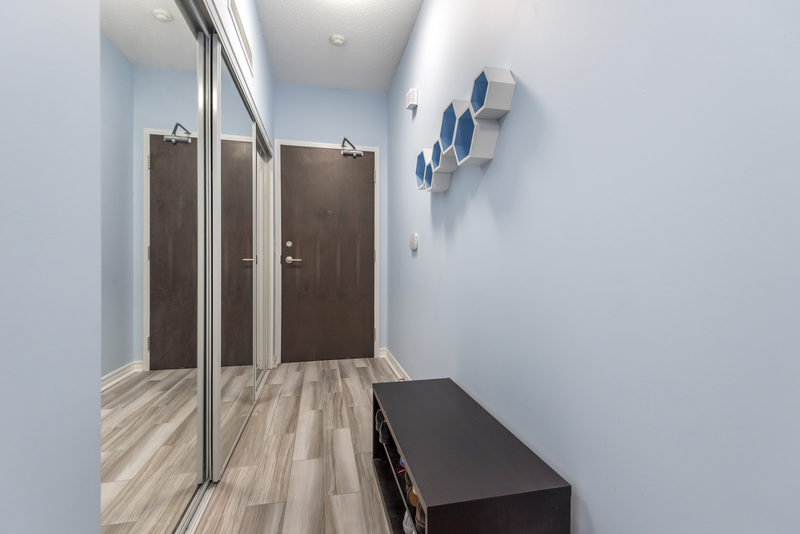 Mirrored closets afford plenty of storage and a convenient way to examine yourself when getting dressed. 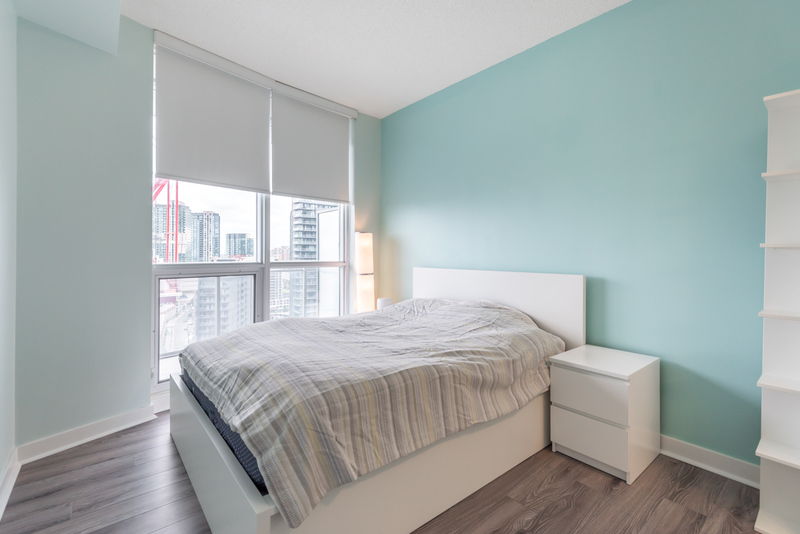 While not as large, the second bedroom is just as luxurious and offers sweeping city views. Plus it’s got a big closet, enormous windows (the abundant sunlight is great for reading or working), and direct balcony access. 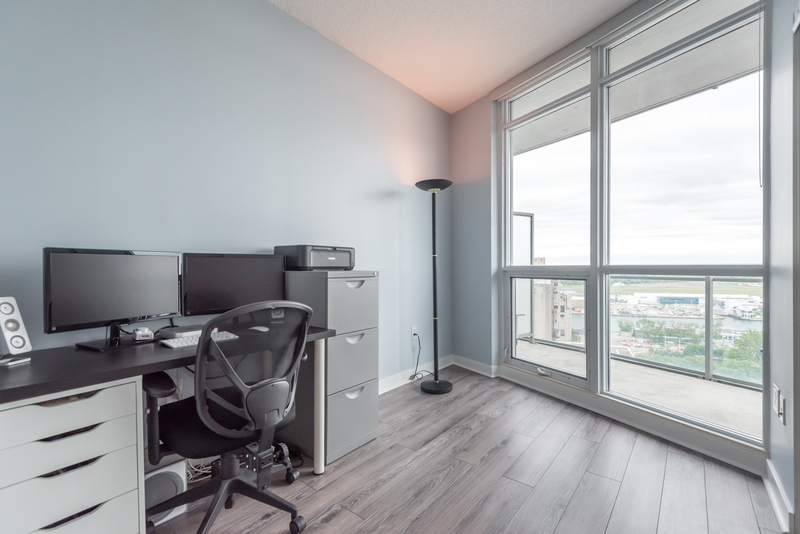 This gorgeous second bedroom can serve as an office, a place to sleep, or a storage room. The master bath is stylish yet functional. 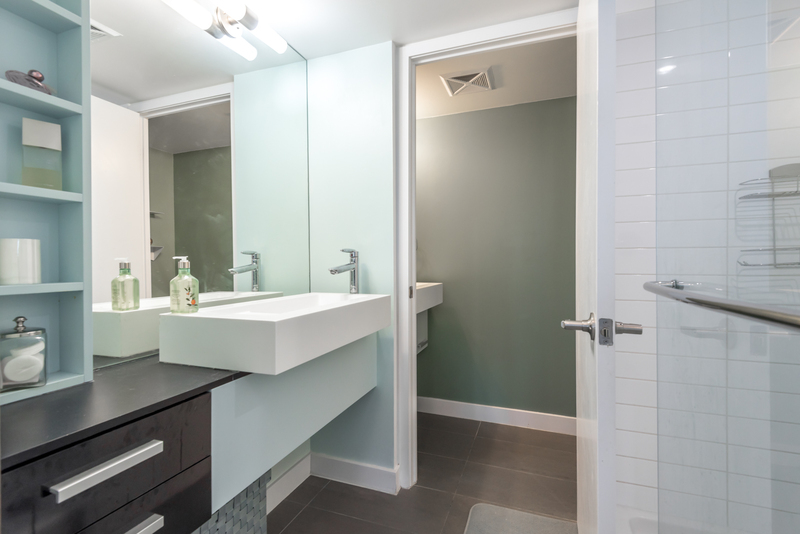 Bright lights, multiple shelves, 2 sinks, a large tub, and an extra-wide mirror fulfill every practical need. At the same time, the perfect geometry in every detail brings an unrivaled visual charm. Washrooms don’t get any more beautiful than this. The second bathroom maybe smaller but it’s just as charming. 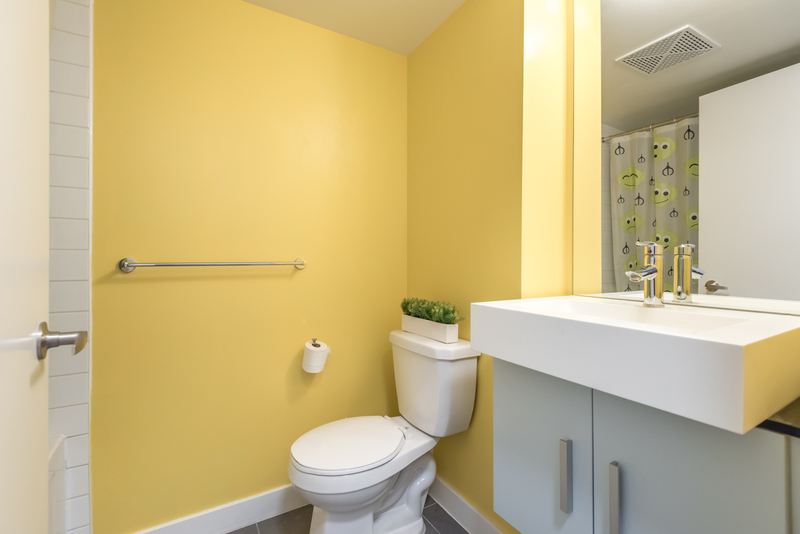 Joyful yellow tones inspire harmony, while under-sink cabinets, a tall mirror, and bathtub add functionality. This washroom aims for a minimalist look, and succeeds. 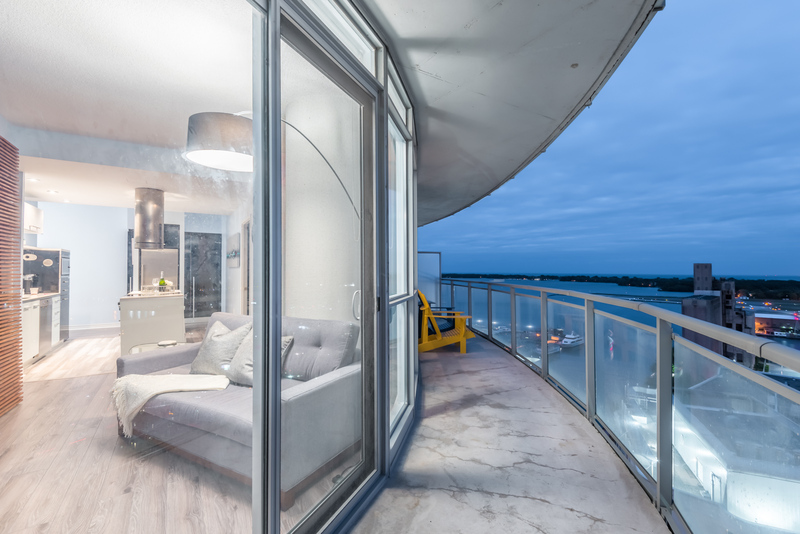 38 Dan Leckie’s balcony offers more than 200 square feet of outdoor space. The extra-wide balcony is a great place for socializing, star-gazing, or relaxing with drinks. Because it curves with the building, residents have a spectacular, almost enviable view of Toronto. On the left is Bathurst Quay, and on the right the glimmering city lights. You won’t find a better view in all of Toronto. 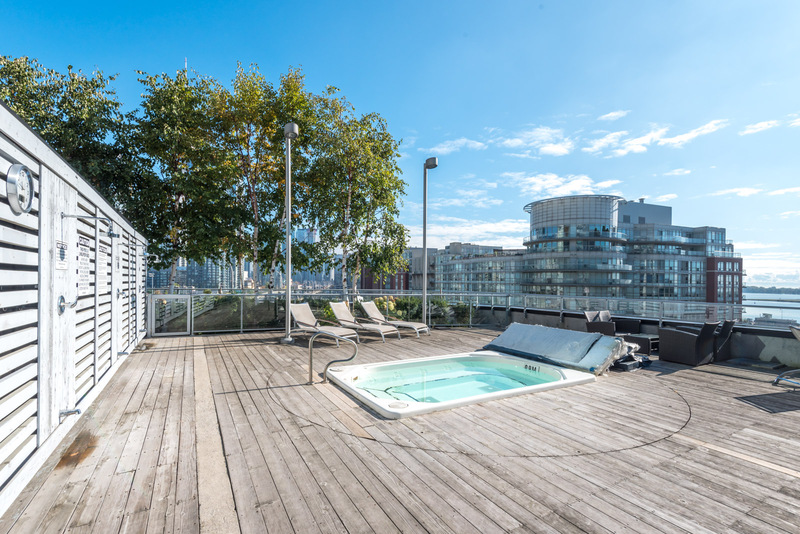 There’s no shortage of luxuries, like this rooftop lounge and hot-tub. Day or night, this part of Toronto is always brimming with life and excitement. 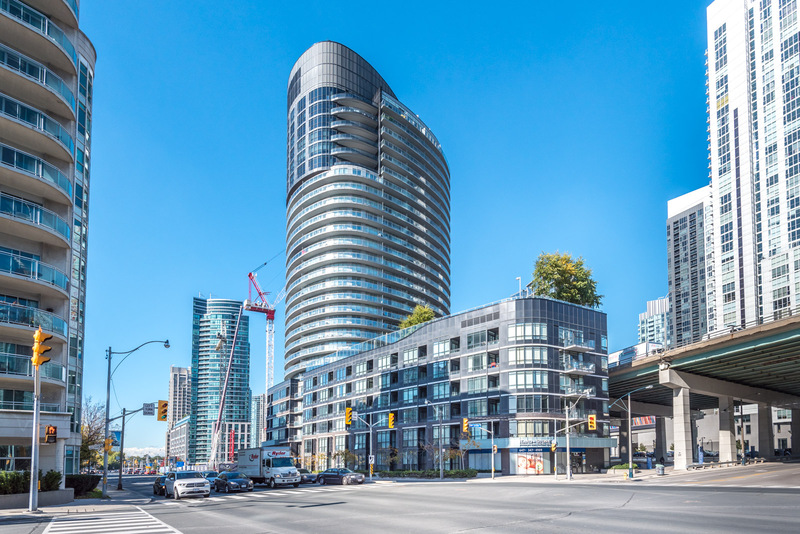 With Lake Shore to the South, Front Street to the North, and King West and Liberty Village within walking distance, 38 Dan Leckie Way puts everything within reach. 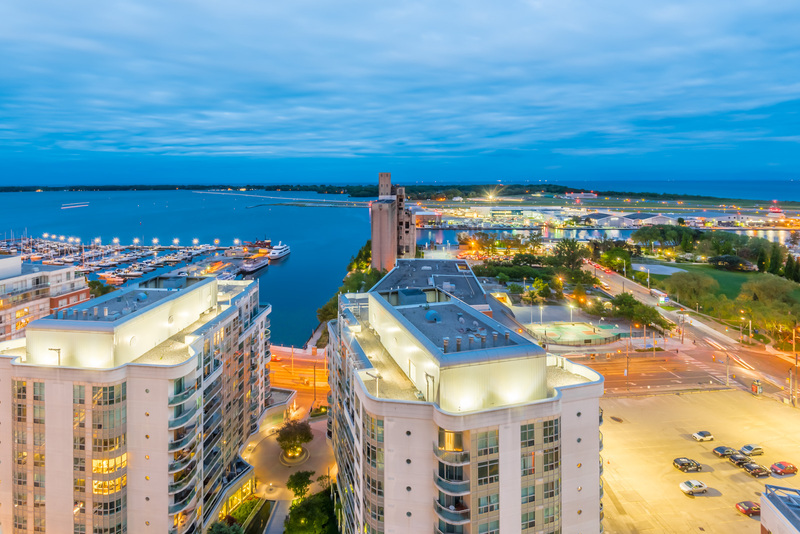 Enjoy the beach or boating at nearby Bathurst Quay or satisfy your craving for culture at the Harbourfront Centre. 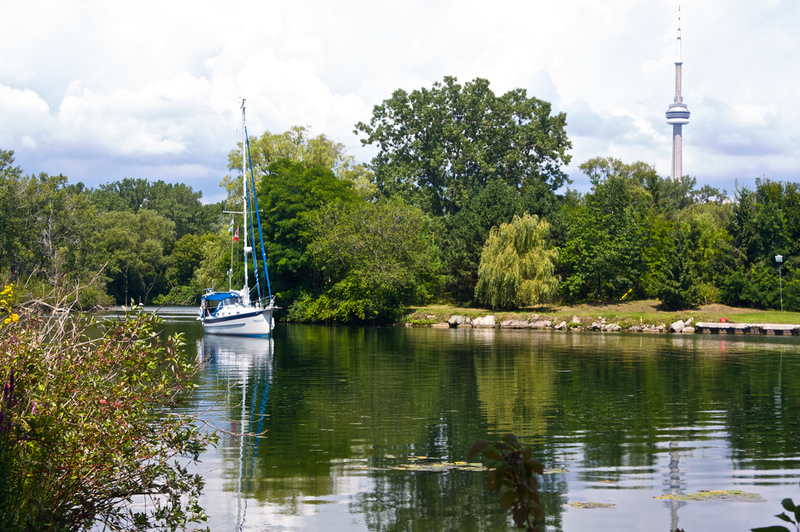 The Toronto Islands are a great place for family activities biking and kayaking (Image Credit: Rudolph Cohilj, Wikimedia). 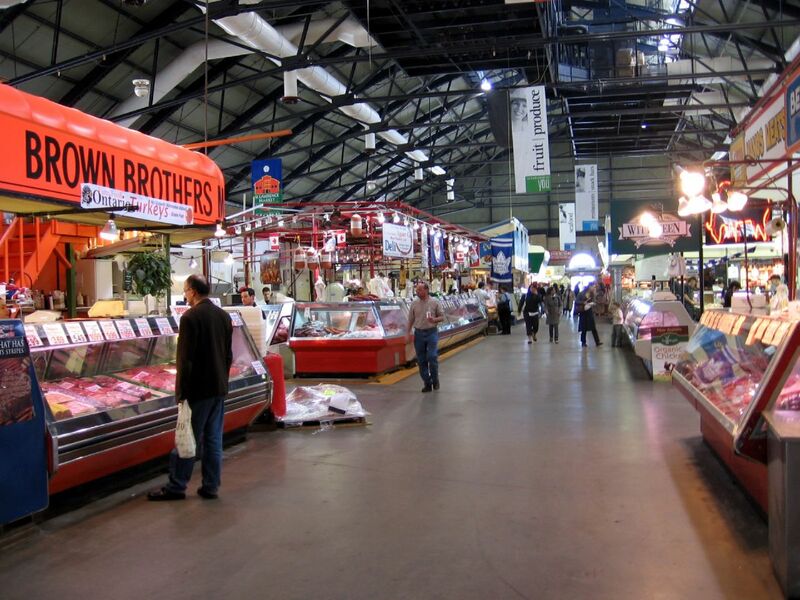 Take in a Jays game at the Rogers Centre or drive over to Front Street, where you’ll find St. Lawrence Market. Bursting with food vendors, fruit stalls & cooking classes, St. Lawrence Market is full of culinary delights (Image Credit: Oliver Mallich, Flickr). 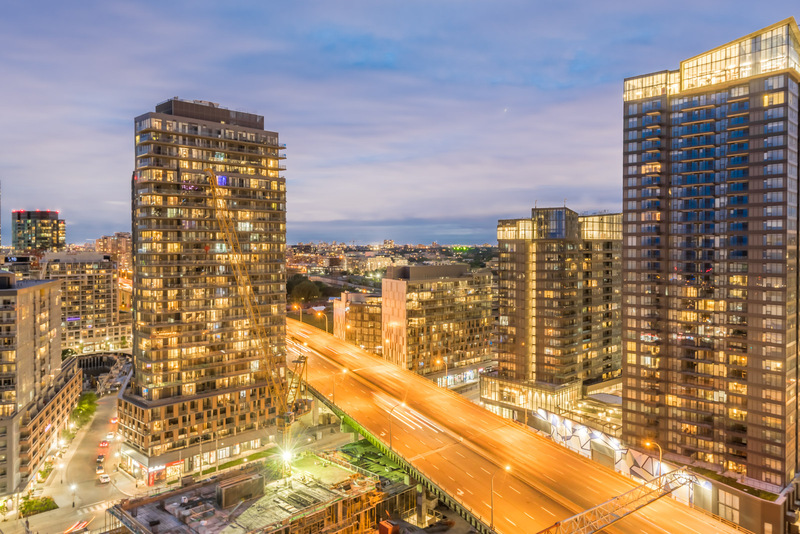 Check out King Street West, the heart of Toronto’s Entertainment District. It has everything for the art-lover in you, from galleries and museums to concert halls and theatres. Not cool enough? Hop over to Liberty Village, which has a huge millennial population and the trendiest shops, studios, and restaurants around. 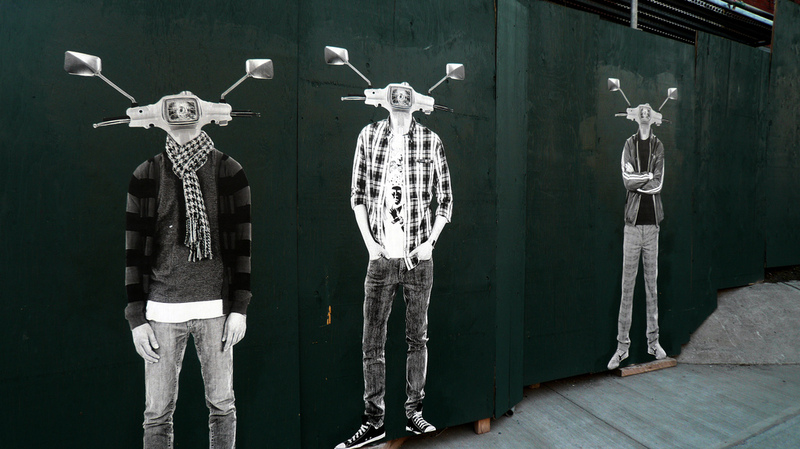 Liberty Village is the hippest place to be, with street art and fashionable retail. The Gardiner gives residents a convenient way to get around Toronto, whether for work or recreation. 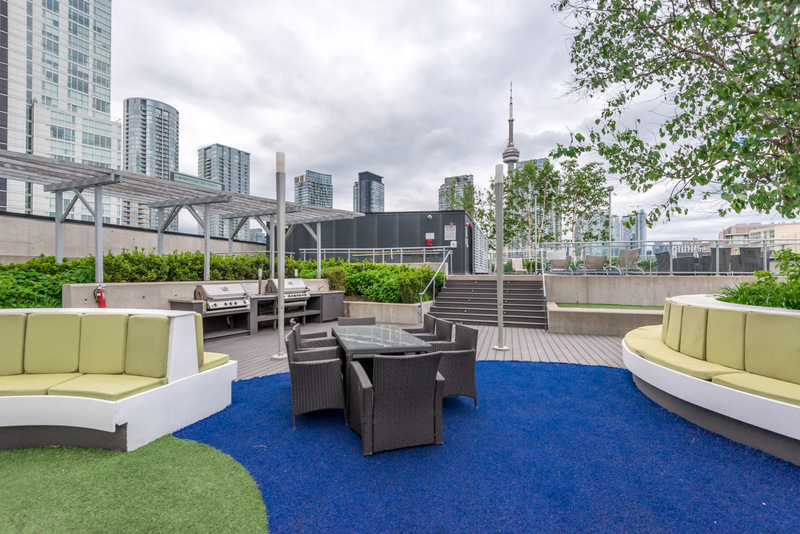 Enjoy sunshine, socials and barbecues from the comfort of Panorama’s rooftop deck. A perfect home is where the inside is just as amazing as the outside. 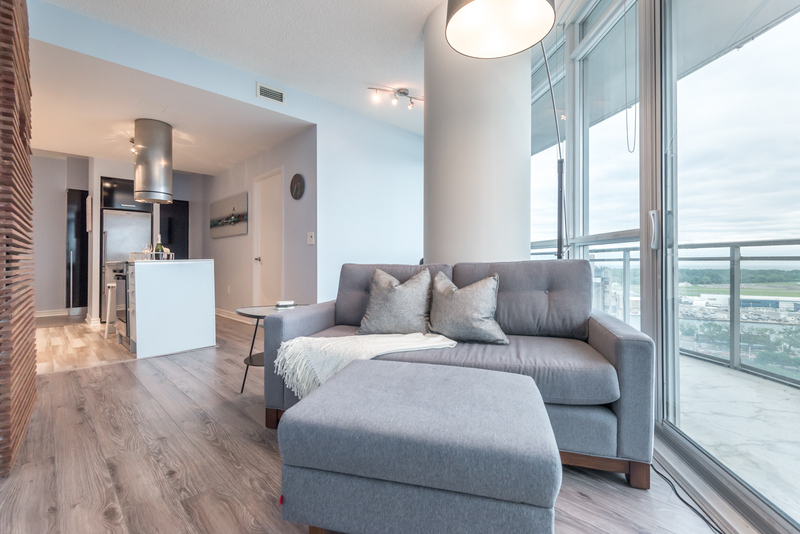 And with 38 Dan Leckie Way, that’s exactly what you get—incredible interiors and amenities, plus a location that can’t be beat. 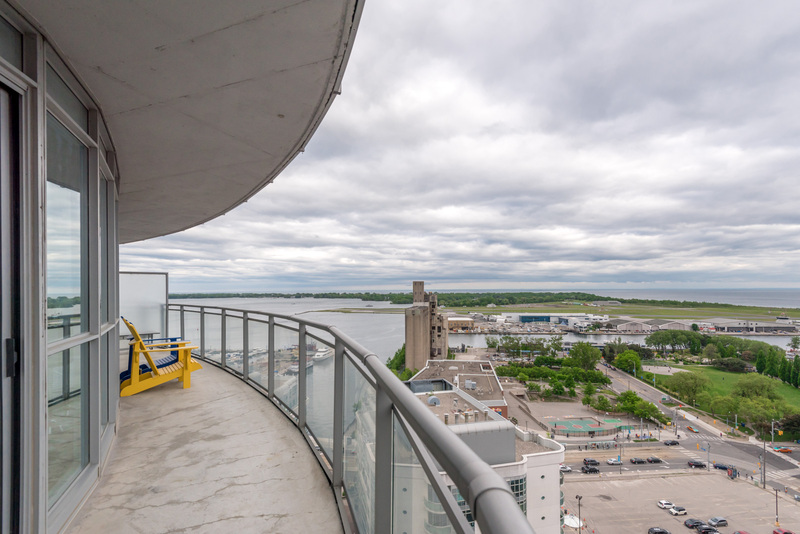 2 bedrooms, 2 washrooms, amazing balcony views, and a fantastic location right on the waterfront. 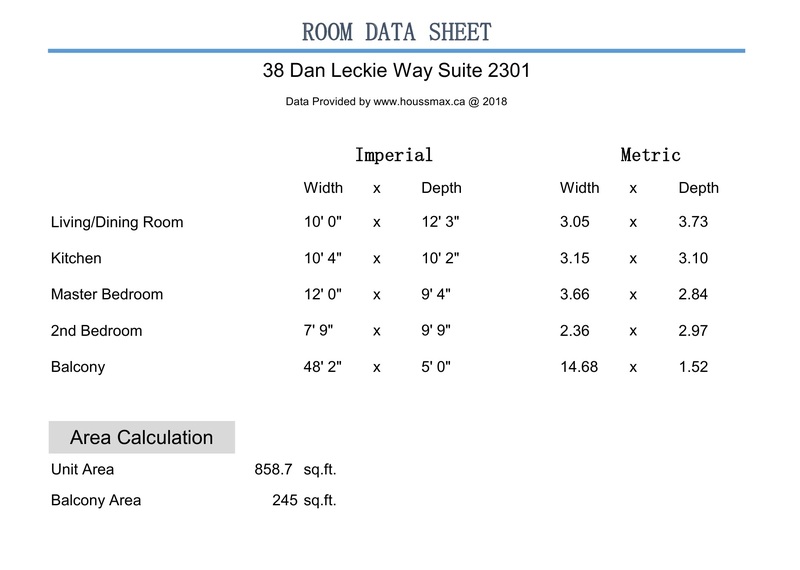 Want to learn more about 38 Dan Leckie Way? Contact me below for more details.